How is the mining reward calculated? Since QuarkChain announced the official launch of Testnet 2.0 mining last week, a large number of community members have actively participated in the Testnet mining event. We have released the Docker Mining Tutorial first. At the same time, mining tutorials on Windows/Mac machines (Chinese/English/Russian versions) have also been spontaneously produced by our community members, which reveals the strong creativity inside QuarkChain communities and blockchain projects’ high dependence on open source community. In order to encourage more community members to participate in QuarkChain Testnet 2.0 mining event and share a prize pool with total of 5 million QKC, we will be releasing a step-by-step tutorial for non-coding background members. Please keep on following us! According to the questions/issues that are frequently asked at Discord, we have set up a regular AMA time every day on Discord. At the same time, engineers have always been engaged in answering questions on Telegram，Discord and WeChat raised by community members. 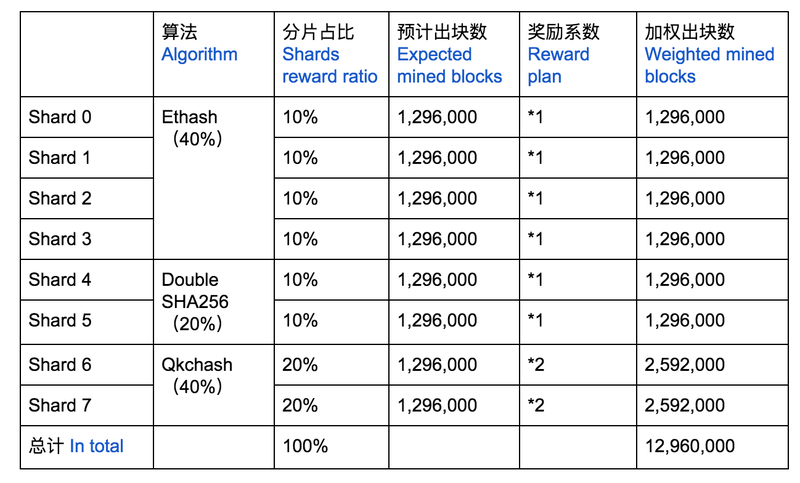 The question ”How is the mining reward calculated?” is one of the frequently asked questions on every channel. Therefore, we offer a rough calculation method so that everyone is able to estimate how much a miner is expected to receive. The number of QKCs each miner is expected to receive upon mainnet launch will be based on the ratio of sharded blocks mined by each miner to the total number of sharded blocks mined by all miners. The number of blocks mined in the first month (December 2018, PST) will be double counted. QKC will be rewarded to eligible miners after mainnet launch. As shown in the above table, since the blocks mined on Shards 6,7 are double counted, the total weighted number of mined blocks on 8 shards is 12,960,000. Mining rewards calculation in Jan.-Mar. To further explain this, let’s take the 1st and 10th miners as examples. The calculated data shown in this article are only for demonstration purpose only, and are not used as a reference for the actual reward. The actual reward shall be based on the final results. The final interpretation right of this activity belongs to QuarkChain Foundation LTD. QuarkChain official team reserves the right to modify rules at its sole discretion. Testnet 2.0 and all rewards described herein are not being and will not be offered in the United States or to any U.S. persons (as defined in Regulation S promulgated under the U.S. Securities Act of 1933, as amended) or any citizens or residents of countries subject to sanctions including the Balkans, Belarus, Burma, Cote D’Ivoire, Cuba, Democratic Republic of Congo, Iran, Iraq, Liberia, North Korea, Sudan, Syria, Zimbabwe, Central African Republic, Crimea, Lebanon, Libya, Somalia, South Suda, Venezuela and Yemen. QuarkChain reserves the right to terminate, suspend or prohibit participation of any user in Testnet 2.0 at any time. In order to claim or receive any rewards, including mining rewards, you will be required to provide certain identifying documentation and information. Failure to provide such information or demonstrate compliance with the restrictions herein may result in termination of your participation, forfeiture of all rewards, prohibition from participating in future QuarkChain programs, and other actions. This announcement is provided for informational purposes only and does not guarantee anyone a right to participate in or receive any rewards in connection with Testnet 2.0.